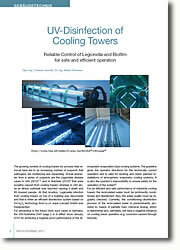 The growing number of cooling towers for process heat removal have led to an increasing number of suspects that pathogens are multiplying and expanding. Actual examples from a series of suspects are the Legionella disease cases in Ulm (2010)1,2 and in Warstein (2013)3 that were possibly caused from cooling towers, whereas in Ulm alone an illness outbreak was reported causing 5 death and 65 insured people. At that location, Legionella infection from cooling towers on top of a building was discovered and that is when an efficient disinfection system based on UV-H2O2 technology from a.c.k. 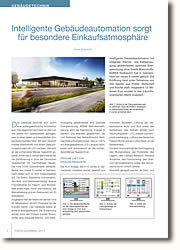 aqua concept GmbH was implemented. 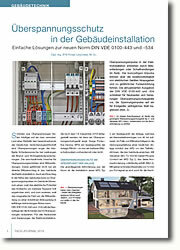 For preventing in the future more such cases in Germany, the VDI-Guideline 2047 page 2 is in effect since January 2015 for achieving a hygiene-proof performance of the atmospheric evaporation type cooling systems. The guideline gives the operator directions for the technically correct operation and is valid for existing and newly planned installations of atmospheric evaporator cooling systems. 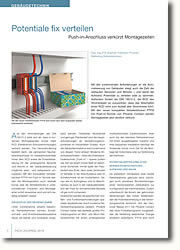 It is also the operator´s responsibility to ensure safety for the operation of the system4. 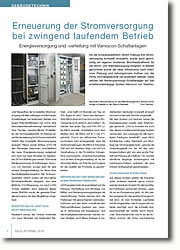 Intelligente Gebäudeautomation mit integraler Wärme- und Kälteerzeugung gewährleistet optimale Energienutzung ohne fossile Brennstoffe: EDEKA Südbayern hat in Gaimersheim ein neues E-center gebaut. Die Eröffnung fand unter Teilnahme von 200 Gästen aus Politik, Wirtschaft und Kirche statt. Insgesamt 13 Millionen Euro wurden in den zukunftsorientierten Markt investiert.